Home / thinking / books / Who’s Afraid of Post-Modernism? 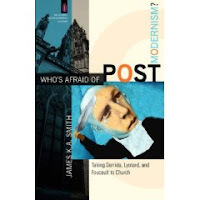 James K. A. Smith gives an interesting introduction to postmodernity that could work for those with little or no theology\philosophy background. Each chapter focuses on a film that he uses to draw out the meaning behind bumper sticker phrases by the most noted of the deconstructionist philosophers. For a general setup of pomo in chapter one he uses ‘the Matrix.’ Chapter two is a discussion of Derrida, the superb film ‘Memento,’ and Derrida’s infamous line ‘there is nothing outside the text.’ Chapter three looks at Lyotard, ‘O Brother Where Art Thou?’ and those evil ‘metanarratives’ modernity gave us. Chapter four is on Foucault, ‘One Flew over the Cuckoo’s Nest,’ and the connection between power-knowledge- discipline. Despite being generally leery of a Radical Orthodox (RO) theologian using philosophy, because I assume they are generally setting up their RO-spike where ‘bame’ being RO is now the best option for the theologian enlightened by Derrida, Foucault, and Lyotard – I really enjoyed and appreciated the first four chapters and think they can stand on their own without agreeing with chapter 5. In chapter 5 Smith gives a proposal that the emerging church be RO and brings a really great film, ‘Whale Rider’ as his back up. I will admit to having a prejudice against RO because to me it is more like theological BO, really old and musky. I decided to read a little on RO before getting harsh on it, so if you have suggestions leave them (Andrew…..). But for now I recommend reading the first four chapters, you can decide about the fifth yourself, and if polled on whether or not the emerging church should go RO I vote no…..but you don’t have to agree.